MAIS is the French word for corn. As I picked up the beautiful ears of corn this evening at the grocery store, i could not help remembering some of my childhood memories about corn. I am sure that now most grocery stores in France sell corn on the cobb, but when I was young, there were not to be found in the store. My mom and I we would go to the nearest corn field and pick up the corn ears that we wanted to eat. It was fun;-) Of course, eating corn on the cobb was very short-lived and very seasonal since you had to pick up corn when it was still young and a pale yellow;-)at the beginning of the summer. I love fresh corn, and more particularly corn on the cobb, so I am really happy that it is available here all year long. Corn is so easy to fix, and it only needs a bit of butter and sea salt to taste great! 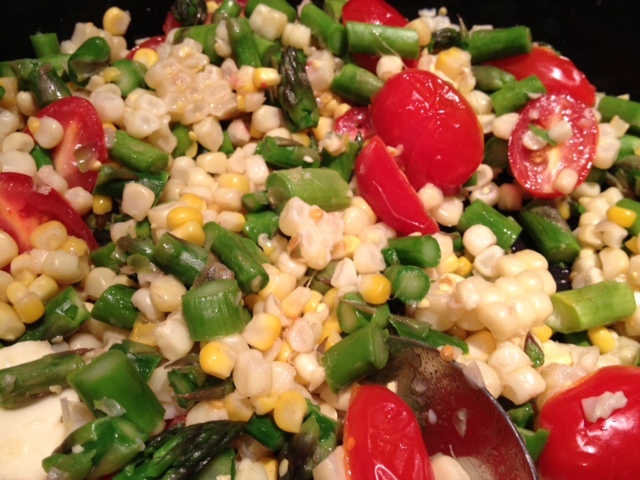 Because I had bought a little too many ears, I was left with a few ears to fix and since I had a few other vegetables I decided that mixing asparagus, corn and tomatoes would be a fun and tasty vegetable fix for the summer. 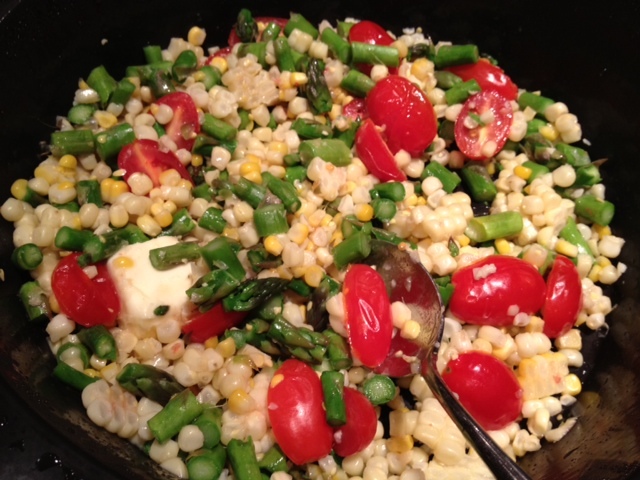 Ingredients for 4: 2 ears of corn, 12 asparagus spears, 1 cup of cherry tomatoes, 1 tbsp of butter, 1/8 tsp of salt, 1/16 tsp of pepper. Place the corn in the round mold and place the octogonal silpat above the round mold. Cook in the microwave for 5 minutes. Be careful to remove the round mold from the microwave and with a sharp knife remove the corn from the ears. Set aside. Break off the ends of the asparagus and cut the asparagus spears into 1/2 inch segments. Slice the tomatoes in half. 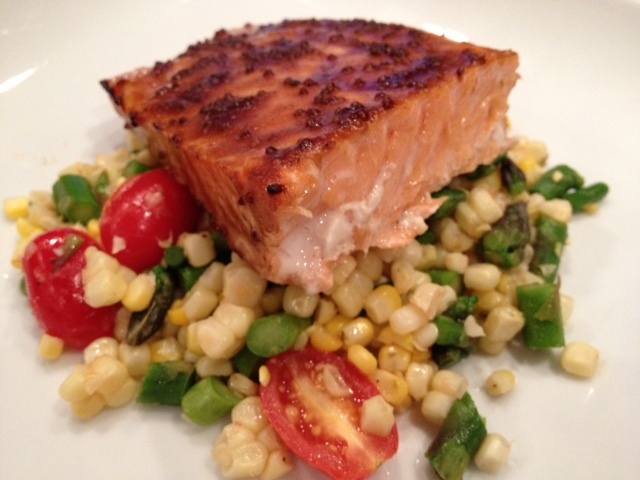 Place the corn, asparagus and tomatoes back into the round mold. Cover the mold with the octogonal silpat and cook for 3 minutes. Remove from the microwave again, add the butter and the salt and stir. Et voila!!! The traditional way to cook Mashed Potatoes would be to cook the potatoes in water, but I thought I would use my flexipan instead. It allows me to prepare my meals so much faster. 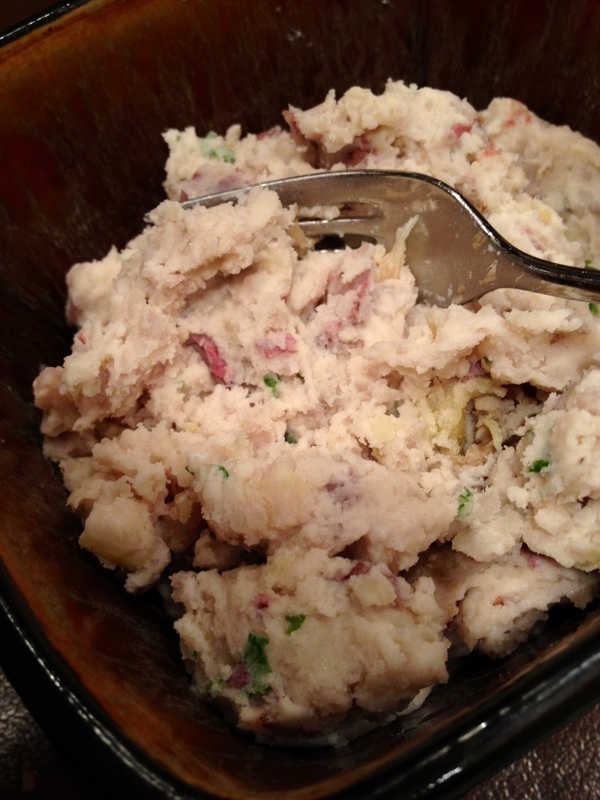 Ingredients: 2 lbs of red-skinned potatoes well washed and cut in quarters, 2 cups of heavy cream or 2 cups of broth, 3 cloves of garlic pressed, 2 tbsp of parsley chopped, salt and pepper to taste. In a large round mold, place the potatoes, 2 tbsp of water, 1/4 tsp of salt, the chopped garlic. Place the silpat on top of the round mold and microwave for 10 minutes. Remove the round mold from the microwave. Remove the octogonal silpat off the top and be careful not to burn yourself with the steam! Empty the content in a bowl, and with a potato masher, mash the potatoes. Slowly add the hot liquid ( broth or cream) and whip the potato. Add more salt and pepper until it is to your liking. I usually add 1/8 tsp of salt and 1/16 of pepper. Add the chopped parsley and stir well. Et voila! My husband loves his potatoes and his red meat but I don’t want to cook red meat everyday because it increases risks for cardiovascular disease and cancer. And since my husband does not eat poultry, it can be a challenge at times to find something to fix for the rest of my gang. I will have to admit that today I was running out of ideas of healthy meals for the rest of my family. As we went home, I asked my daughter what she wanted to eat, and the replied;” I don’t know…”. That was much help! So once again I browsed in the grocery store in search of finding my inspiration. My husband loves veal so I decided that this is what he would have. 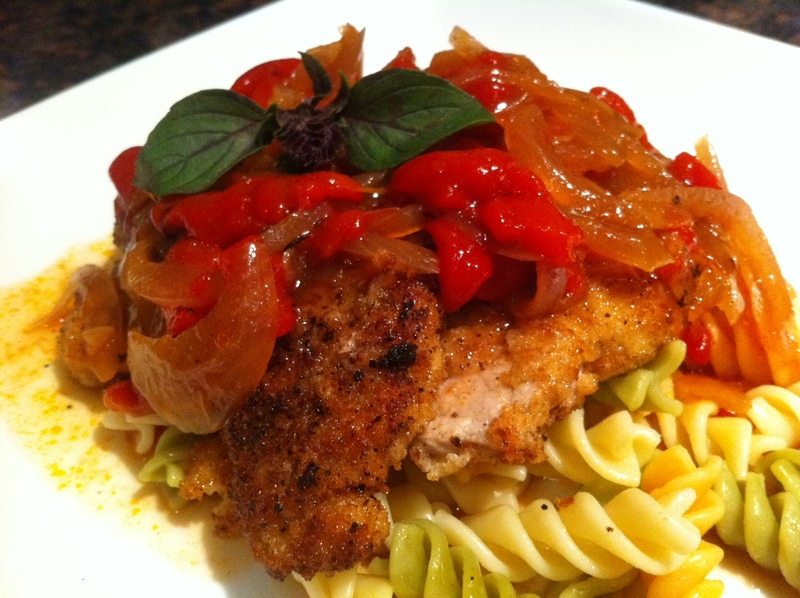 Ingredients: 2 veal scallopinis, 2 red pepper halves sliced in small strips (from a container of roasted bell pepper), 1 purple onion sliced thinly, 1 cup of broth, 1 cup of white wine, 1/8 tsp of salt, 1/16 tsp of pepper, 2 tbsp of brown sugar, a dash of red pepper flake. 2 eggs, 1 cup of milk, 1 cup of flour. 1 cup of italian breadcrumbs, olive oil. In a frying pan, put 2 tbsp of olive oil and turn the heat up. Add the sliced onions and saute them until they become brownish and soft. Add the bell pepper to the sauteeed onions and saute then. Add the warm broth, the white wine, salt, pepper and sugar and bring to boil. When the sauce has come to boil, reduce the temperature to medium low and let it simmer until the sauce has reduced to half ( it may take 10-15 minutes). Stir periodically to avoid scorching. While the sauce is cooking, fix the veal scallopini. Prepare 3 shallow plates. In one, place the egg with a dash of salt and pepper and beat the eggs to mix the egg whites to the yolks. In another bowl, place the flour. In another bowl, place the milk. In another bowl, place the crumbs. Place the scallopini on the roulpat, fold the roulpat over the meat and with the rolling pin, beat the scallopini until it is flat and thinner. Repeat with the other scallopini. Cut each scallopini in half. Place the scallopini first in the flour, then in the milk, then in the egg mixture and then finally in the breadcrumbs. Place the scallopini in the frying pan and cook for 1 minute on each side. Repeat with all the scallopinis. I fixed pasta to accompany this meat. You can cook the pastas according to the package direction. To serve, place the pasta on the plate, top the pasta with a scallopini. Drizzle the sauce over the meat and pasta . Et voila!!! Ingredients for 4: 4 tbsp of sun-dried tomatoes, 2 tbsp of fresh basil chopped, 4 tbsp of nuts ( I used pine nuts), 2 tsbp of dried onion, 2 tsbp of brown sugar, salt and pepper. 1 cup of water, 1 cup of chicken broth, 1 cup of semolina couscous, 1 tsp of paprika, 1 tsp of dried minced onion, 1/2 ts of garlic powder, 1 tsp of dried parsley, 1 tbsp of olive oil. salt and pepper, 4 tbsp of pine nuts. Utensils: 1 large round mold, octogonal silpat, medium-sized perforated sheet, and medium-sized silpat, saute pan. In a small chopper, place 4 tbsp of sun-dried tomatoes, 2 tbsp of fresh basil chopped, 4 tbsp of nuts ( I used pine nuts), 2 tsbp of dried onion, 2 tsbp of brown sugar and chop well until all the ingredients are well-blended. Place the salmon filet on the silpat, sprinkle salt and pepper and cover the filet with the sun-dried tomato “paste”. Cook in a warm oven at 375 for 8-10 minutes. While the salmon is cooking, place the couscous, water, broth, and the other ingredients ( 1 tsp of paprika, 1 tsp of dried minced onion, 1/2 tsp of garlic powder, 1 tsp of dried parsley, 1/8 tsp of salt, and 1/16 tsp of pepper) in the large round mold. Cover with the octogonal silpat and cook for 5 minutes. When the couscous is cooked, fluff it up with a fork and add 1 tbsp of olive oil. Place a saute pan on a warm stove ( medium heat), and add the pine nuts. Saute the pine nuts until they become brown and golden. Keep stirring to prevent scorching. Mix the pine nuts to the couscous. Et voila! 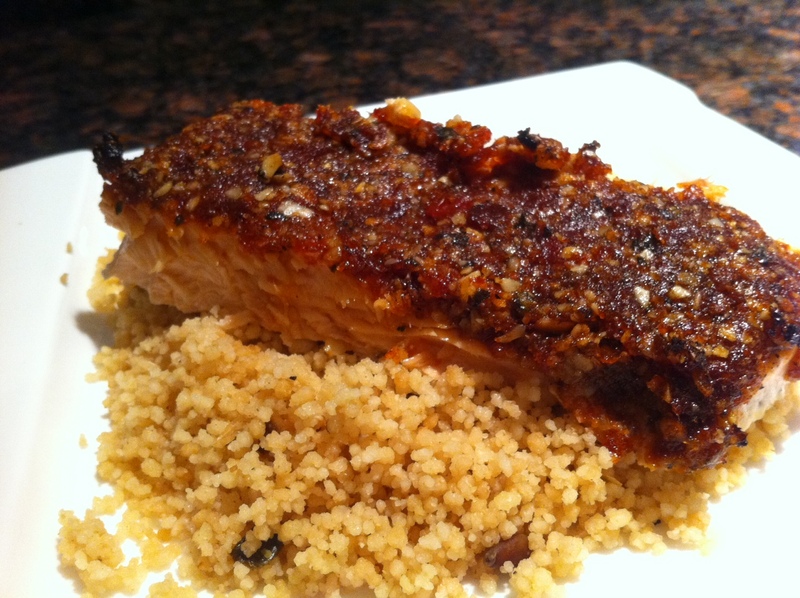 To serve, place the couscous on a plate and place the salmon on top. C’est tout! 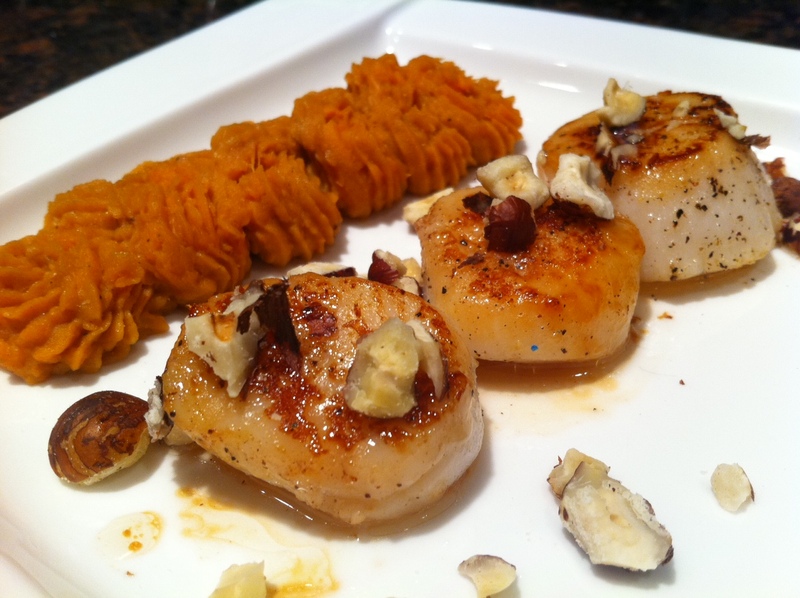 Ingredients for 1 : 1 sweet potato, 2 oz of mascarpone, 1 tsp of brown sugar, hazelnut oil and salt and pepper to taste, 4 scallops, 1 tbsp of chopped hazelnut. Utensils: Demarle 10″ frying pan, large round mold, octogonal silpat, polyamide spatula, Demarle paring knife, potato masher, measuring spoons. Peel the sweet potato, cut it in cubes, and place in the round mold. Cover the round mold with the octogonal silpat and cook in the microwave for 5 minutes. Remove the round mold from the microwave, and place the soften sweet potato cubes in a large bowl. Puree the potato with a potato masher. Add 2oz of mascarpone, 1 tsp of hazelnut oil, 1 tbsp of brown sugar, 1 smidgen of nutmeg, 1 smidgen of pepper, 1 pinch of salt to the mashed potato and mix well. You may add more mascarpone if you wish to have creamier sweet potato puree. Set aside. In a frying pan, saute the chopped hazelnut to roast them over medium to high heat. season with salt and pepper by sprinkling a bit of each on the scallops. Remove the hazelnuts from the pan, and set them aside. In the same frying pan, warm up 1 tsp of hazelnut oil and saute the scallops for a few minutes on each side. Season with salt and pepper. To serve, place the scallops on the plate and spoon the sweet potato puree next to it. Add 1 tsp of hazelnut oil in the frying pan, and stir off the drippings. Season with salt and pepper and drizzle the drippings over the scallops and the puree. Sprinkle the roasted chopped hazelnut over it all. I love vegetables so I am always cooking some. I usually eat whatever I see, and whatever strikes me fancy in the grocery store 😉 Today, I cooked brussels sprout because they are actually something my husband would eat. Ingredients: 1 pack of brussels sprouts, 4 slices of bacon, salt and pepper. Rinse the brussels sprouts in water with a little bit of vinegar. Remove the outer leaves of the brussels sprout if they are damaged. Place them in the large round mold, add 1 tsp of water mixed with 1/8 tsp of salt. Cover the large round mold with the octogonal silpat and microwave for 5 minutes. The brussels sprouts should be cooked but still firm ( I don’t like them too soft). Cut them in half. While they are cooking in the microwave, cook the bacon in a frying pan until it becomes crispy. Remove the bacon pieces from the frying pan. Keep 1 tbsp of bacon fat and discard the rest. In a frying pan, place the 1 tsbp of bacon fat and turn the heat to medium high. 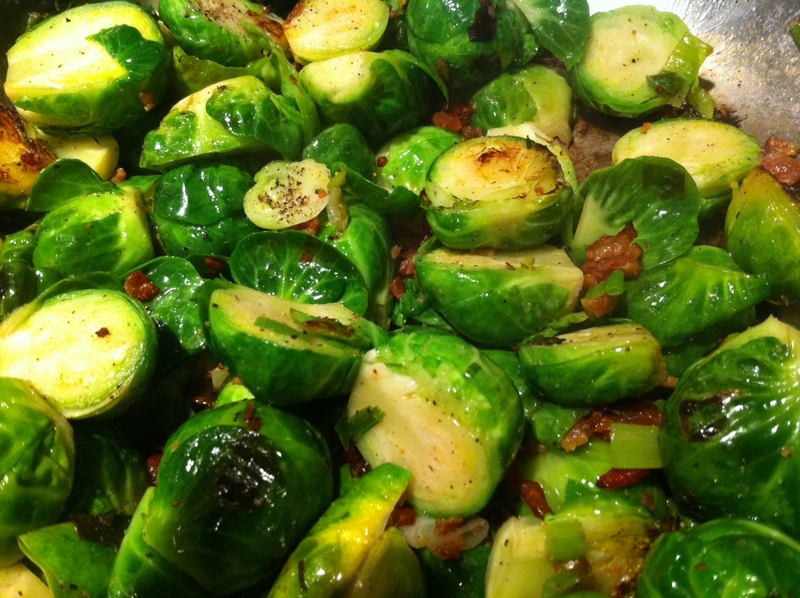 When the bacon fat is sizzling, add the brussels sprouts, the cooked bacon and cook the sprouts for a few minutes stirring constantly so that they will not burn. Season with salt and pepper. Add 1 tsp. of chopped parsley. Et voila!! Ingredients: 1 bag of new potatoes ( preferably white, they cook quicker than the red one and or the purple one and when you are in a hurry, it is what you need…), 1 tbsp of butter melted, 1/8 tsp of salt, 1 dash of fresh pepper, 1 tsp of chopped parsley. 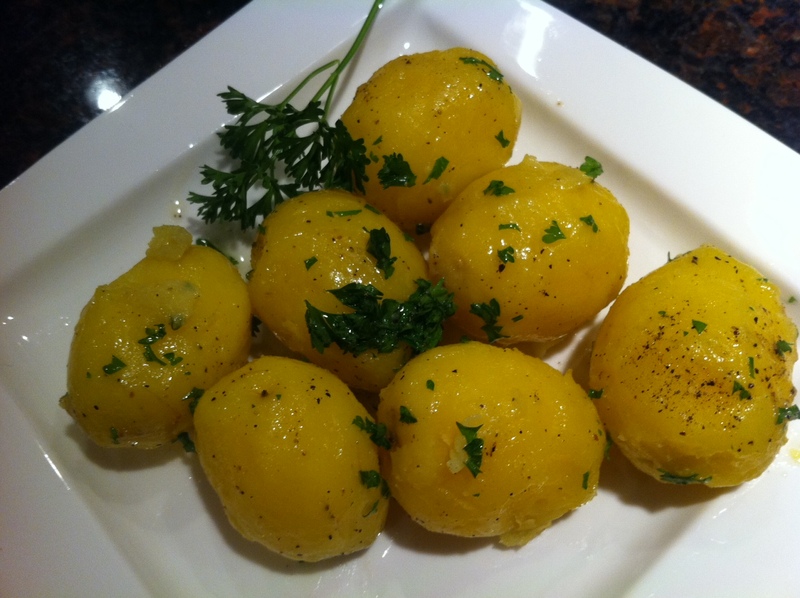 Place the new potatoes in the round mold, add 1 tbsp of water and 1/8 tsp of salt. Place the octogonal silpat on the round mold, and cook them for 8-9 minutes in the microwave. Remove the potatoes from the round mold, peel the skin off, add the melted butter, the chopped parsley, the pepper and stir well. Add salt if needed. Et voila!! !